Why should I adopt a dog when I can go down to the pet shop and buy one? There are many abandoned and unwanted pets in Greece which are in need of a caring, loving home. They are perhaps wandering alone, chased by shop, hotel or restaurant owners as they try to beg food from their customers. They may form packs which can be quite intimidating. Sometimes they find a permanent home in a Greek household however, there are so many unwanted pets that many households have already adopted pets. The present economic climate in Greece means it is difficult for people to justify the additional expense of properly caring for a pet. 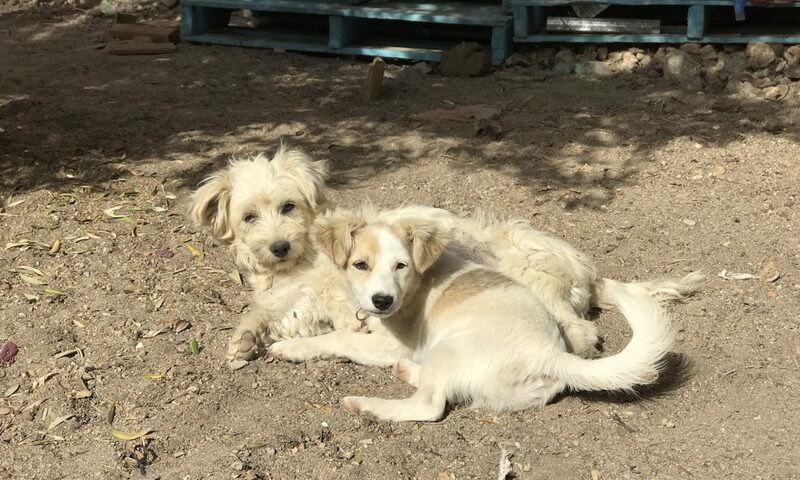 By adopting a pet from Greece you are providing a permenant, supportive and caring home to an animal which may be being fostered or living in a shelter. Like everyone else, the dog did not choose the place he was born: they are a victim of circumstance. How do I know that the dog is fit and well? When a dog arrives at the shelter it is checked for any outward signs of injury or disease and given worming and flea treatment. The dog is innoculated with a polyvalent vaccine against rabies and contagious and zoonotic diseases. It is also protected against Leishmaniasis, a parasitic disease, mostly fatal in dogs. As part of the program of responsible pet ownership all dogs are neutered to prevent unwanted puppies and protect the animal from certain diseases. To travel abroad pets must undergo a physical examination by a veterinary professional who then issues a Pet Passport for international travel. The vet checks that the animal has a functioning identity microchip and records this number in the passport. A microchip is inserted if one is not present. Dogs must have a current rabies vaccination and have been recently wormed if traveling to UK. Are the dogs house trained? The dogs live outside for all or most of the year since the climate is mild. They live in compounds where there is shelter and somewhere safe and dry to sleep at night. They get taken out for walks and are used to being on the leash: they will come back when they are let free. They are used to living in the countryside so have little experience of heavy traffic or city life. You may need to acclimatise your new friend to your lifestyle and surroundings. Like any friendship, it’s going to need work. As with any dog going to a different environment, there is the possibility of accidents in the early stages. These can be minimised with careful preparation and planning. It is better to introduce the animal to your home is progressive stages and to not overburden them at the outset with too many new experiences. If I decide to adopt a dog how do I know we are going to get along? Dogs, like humans, are all different. Some are more bouncy or like to play ball, others not. By understanding your personal circumstances it is possible to suggest a dog which might be more suitable. You would certainly be encouraged to see the dog for yourself and to spend time together before deciding. After all, you are likely to be spending a lot of time together. Are my circumstances suitable to dog ownership? A dog is a pack animal so prefers to be part of a group. This does not mean you must have several dogs for them to be happy. You and your family will become his new pack, and you his pack leader. You will decide what he does by providing a framework for him. Your dog is capable of adapting to most circumstances. You may both need to make some changes; flexibility is the watchword. You need to be sure before adopting a pet as it is a real commitment to care for your pet for his entire life. Like the marriage vows, for richer, for poorer, in sickness and in health… Taking on a pet has its financial implications. What are likely to be the on-going expenses? You don’t need to buy fancy stuff for your dog. He is probably just as happy to drink from a repurposed plastic food container as a shiny new stainless steel bowl. Likewise a dry wooden box placed in a draught-free location with a warm blanket is as good as a designer dog bed. Spend your money on the best pet food you can reasonably afford. To keep your pet healthy, the occasional visit to the vet may be required and you are going to need to protect your dog from fleas, ticks and other parasites depending on your location. If I have to go away, what then? In many situations, if it’s convenient, your dog can travel with you, even on a plane. Lorry drivers travel thousands of miles with their dog in the cab. Dogs can adapt to living on a boat or travel on a ferry for several days. The UK cross channel ferry companies allow your pets to travel in the car and, for example, Greek ferry companies will welcome your dog and even provide accommodation for him. Traveling by air to UK can present certain complications which may be overcome with a little imagination. There are plenty of dog-friendly hotels and camping places so you don’t need to leave your dog behind. There are many abandoned and unwanted dogs in need of a caring, loving home. Uniting an animal with a suitable owner is the goal of this site.